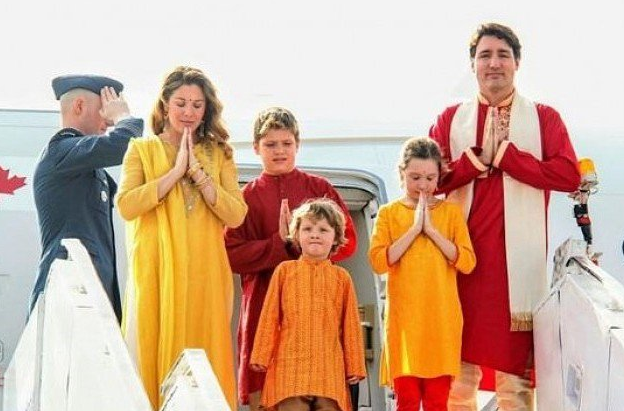 Critics have slammed Canadian Prime Minister Justin Trudeau’s trip to India in February as a failure, yet new documents suggest it has been an expensive trip exceeding $1.5 million. The cost includes $323,000 for hotel stays, $485,070 to fly and staff the VIP Airbus for 43.7 hours over the nine-day trip, $5,235 for cell phone fees, $5,100 to buy Canadian wines for use at official events and $17,044.21 to fly Vancouver Chef Vikram Vij to India, where he cooked a dinner for a meeting and an official reception at the Canadian High Commission in New Delhi. Conservative MPs hit the lavish trip as a huge waste of money since they say it produced virtually no return on the investment. On the contrary, they said the trip even became a source embarrassment for the country when the Prime Minister’s Office accidentally invited to a reception a man convicted of attempting to murder an Indian politician more than three decades ago. Trudeau for his part defended the trip and said it helped secure $1 billion in two-way business deals between Canadian and Indian companies that will help create 5,800 jobs in Canada. He also said what he spent in his 9-day visit to India by comparison is less than what former Prime Minister Stephen Harper spent to travel there for six days in 2012 or three days in 2009. Trudeau’s office said the 2009 India trip cost $1.4 million and the 2012 trip $2.5 million. The 2012 bill included $1.2 million to fly two armored Cadillacs and a bullet-proof SUV when the RCMP deemed them necessary for security purposes. Trudeau’s office said the current PM used cars provided by the Indian government and Canada spent about $58,800 on cars and drivers for the trip. The trip was meant to improve ties between Canada and India, a populous country of more than 1.3 billion people with one of the fastest-growing economies in the world. Indian concerns about Sikh separatist sympathizers marred Trudeau’s entire trip. It also appeared that Indian Prime Minister Narendra Modi purposely gave Trudeau the cold shoulder for the first several days. Modi did not meet Trudeau’s plane at the airport. Some argued it was not a snub, just a matter of protocol. But Modi did go out of his way and showed up to shake hands on the tarmac with French President Emmanuel Macron when he arrived in Delhi. Some argued Modi’s decision not to meet Trudeau’s plane at the airport was not a snub, only a matter of protocol. However, just a few weeks later, Modi did show up to shake hands on the tarmac with French President Emmanuel Macron when he arrived in Delhi. Many remember the trip, however, most for its notoriety for the blunder Trudeau’s team committed in India when they invited to two receptions Jaspal Atwal, who was convicted of the 1986 attempted murder of an Indian cabinet minister on Vancouver Island in a plot organized by a Sikh separatist extremist group. Atwal attended a reception in Mumbai and even posed for photos with Sophie Gregoire-Trudeau and Infrastructure Minister Amarjeet Sohi. His second invitation to another reception was rescinded when officials realized their blunder when informed of Atwal’s identity. Probably spent a lot on eyebrow glue as well.